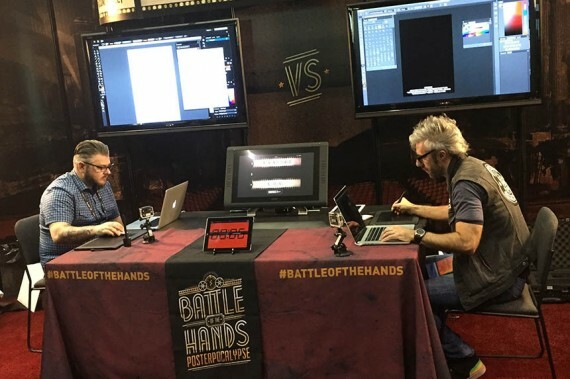 In this year’s MITX and Hatch Award-winning Battle of the Hands experience at the Adobe MAX creativity conference, SapientNitro created an entire ecosystem of digital tactics to support the theme: Battle of the Hands: Posterpocalypse, where two designers battle to design a movie poster in eight minutes. The “Randomizer” application displayed on a 22” touchscreen gave battlers a random movie title, genre, and art direction. All the while MacBook Pros were projected onto 50” LCD screens mounted on the booth for the over 100 spectators. A microsite with teaser video and gallery from last year was created, and online brackets were updated live as competitors were eliminated. Live social updates attracted noted attendees James Victoire, Hydro74 and SignalNoise to participate as special guest battlers. Profile videos, webisode series, and 2014 poster gallery hosted on the microsite for post-event promotion. The SapientNitro team stepped up its game to deliver on a bigger and better experience in 2014, leaving Adobe MAX organizers and attendees primed for next year’s battle. The event garnered more than 170 public posts from over 60 unique contributors and 1.15 million Twitter impressions.